← Kill Mold and Mildew with Tea Tree Oil Review – Does it Work? 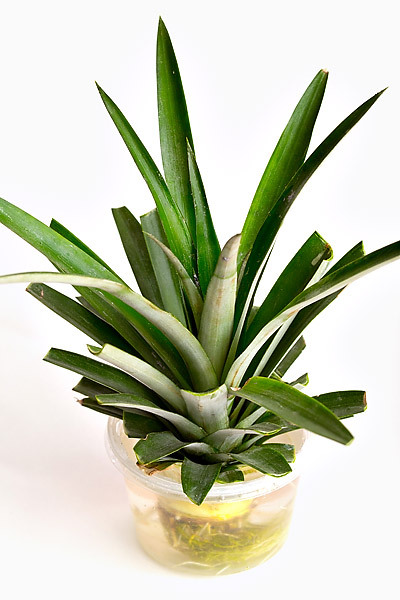 Growing Pineapple Plants from Pineapple Tops Review – Does it Work? Pineapples are yummy tropical fruits that originated in South America, but can be grown in most any warm climate. A popular science project for children is to propagate your own fruit from any pineapple you pick up at the grocery store. But does it work? Can you actually grow your own pineapple at home? (full disclosure: this gorgeous pineapple plant was sprouted and given to me by a friend. So, really I’m writing about her experience). An easy pineapple sprout all depends on picking out the right piece of fruit at the store. You should look for one that has not been cored, has all the center leaves on it, and has fresh, small leaves in the center. Make sure it is relatively soft and ripe. When you get home, grasp the top of the pineapple carefully and twist up slowly so the core comes out. You should be able to see little white nubbins which are the where the roots will sprout from. Place the top in a shallow dish of water, and leave it in the sun. It’s as easy as that! When you get a good root ball going, it is time to plant in a sunny spot with well draining soil. Look at that gorgeous root ball! Some trouble shooting tips: keep the water just below the level of the leaves. You don’t want the leaves to get wet. If they do, and they start to rot, you can just remove them and place the top back into the water. You can plant in a pot (keeping in mind that these can grow up to two feet in diameter and be rather spikey). Or you can plant outside if you live in a climate that is warm year round. I’ve planted mine in a corner of the garden. In a couple years when/if it flowers and grows fruit I’ll do the second half of this review. Do you think we’ll get a pineapple? Have you ever tried sprouting your own pineapple? Have you ever actually gotten one to grow big enough to fruit? This entry was posted in Gardening, Real Food and tagged better for the earth, easy, gardening, kids, kitchen, real food, saves money. Bookmark the permalink. 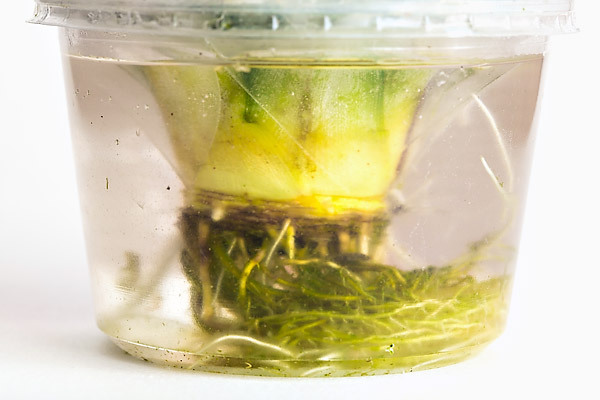 21 Responses to Growing Pineapple Plants from Pineapple Tops Review – Does it Work? Pineapples can bear fruit in about a year. To encourage fruiting, place an apple core or a piece of apple at the base of the plant. Decomposing apple give off an enzyme that stimulates fruit and flower production in certain plants, such as bromeliads and pineapple. Also, our dozen or so thriving pineapples plants were never started indoors. They were twisted off the pineapple, planted right in the ground, and watered daily for about a week until new growth was evident. Easy peasy. That’s great…but where do you live? I doubt this would work in Oregon. I’m thinking start in a pot and keep indoors during winter. I’m in sunny southern California, so this would be an outdoor project for me. But I’ve read that some keep the pineapple plants in pots and bring them in for the winter. Great adds – thanks Betty! WOW! I would’ve never imagined you could do something like this with a pineapple! Very interesting!!! Yes… it sounds like it takes a long time but it’s probably even a great project for children too! I live in Baton Rouge & I started my pineapple tops in Ragu jars. Once they established good root growth, I transplanted them outside. I planted them in between the sprawling ground roots of an old oak tree that is beside my house. That was 2 years ago. This year, 1 of them has a baby pineapple growing out of the top. WE ARE SO EXCITED!! I started propagating pineapple plants with my children about four months ago. We have 8 tops with roots on them. I have potted two and put them outdoors. I quickly discovered that the recent drought and extreme heat was not good for them. I moved them to a shady spot and keep them very wet and they are doing great. I use narrow necked salsa jars for mine and it works perfectly to begin the roots. I am enjoying them as plants and will feel really blessed if they ever produce fruit in pots. We are in West Tennessee and the winters can get pretty cold. I love this idea, thanks for the tip! We live in Central Africa and have a backyard full of them! Yes, it really works! Here the soil is rich enough and rain plentiful enough that we just plant them straight into the ground. We’ve had a little trouble keeping our dogs away from them, not breaking off the leaves, but we harvest pineapples weekly from our yard. 🙂 Love that about Congo! They really love bat guano or cow manure for fertilizer too. Now all I need is some bat guano 😉 Thanks for sharing, Kimberly! I started 12 of these from tops the store. I simply put them directly thrown out at the grocery were be in the ground. They ALL started to grow and produce new leaves. Then the deer found them . Seems deer love pineapples! they chewed them down and then pulled them out to finish them off. I live in central Texas and get only short freezes.Figured they could be covered. Will try again once I have fencing. Other things can be started from leftovers. Sprouted potatoes, lettuce, onion , celery, cabbage, You can plant pieces of ginger root. Carrot tops re root but don’t make carrots They do make nice ferny plants though. Many thing can be started from the seeds and pits. Avocados, and mangoes come to mind. We live in Oregon and started a pineapple plant last year…we brought it in the winter…haven’t tried to make it bloom yet! Think I’ll give it a try. Yes, I have, and I did a post back in Sept 2011 with very detailed pics: Maui Jungalow: How to grow a pineapple from a pineapple top.. It’s been interesting to see variations of this post on pinterest and also see it reblogged by others (with their own original pictures and text). I’m really not sure who/what posted info on this originally online, or whether several people did it at the same time. I found out about doing this when I moved to Maui in 2004, and it was common knowledge. I’d be curious if you find any posts older than Sept. 2011 using the water technique to grow pineapple from the crown. Aloha! I do recommend getting the sweetest pineapples, like the Maui Gold pineapples. I live in Indiana – every time we have a fresh pineapple, we cut the top off, clean the fruit from under it and put it in a pot of dirt. In the summer, we put this on the deck, and just water daily, in the winter, we put in the front window. We then transplant (after several months) around a cherry tree and blueberry plants which I have out front. We have found the deer and rabbits do not like the “spikes” on the plants so they tend to not be interested in that area of our yard. You have to clean the fruit off the underside or it will attract raccoon’s and squirrels – they’ll dig up and eat the fruit and leave the plant. This happened a few times, we just transplanted and the plant was fine. After you harvest the new pineapple, if you continue to care for the plant will it bear a new pineapple the next year? i dry my tops for a couple days then place in water until roots appear. then i plant in soil. Oh yes definitely as I have harvested pineapples from tops and side shoots, from just two pineapple tops I now have 300+ pineapple plants and have also enjoyed lovely sweet fruit by feeding it on a regular basis with bounce back and what’s more they are growing in my back yard. I am hoping to increase my number as it is I have maybe another 80 shoots to remove from the mother plant. My pineapples is the table one and I also have two which is the canning type which are in large pots at the moment until it fruits I will then plant them in the ground.